Holly: The best/worst thing about this book is its cover. I’ve included a picture of the back cover (below) because it, too, is spectacular. Sure, people still need to learn to type, but this is not the book to teach them. 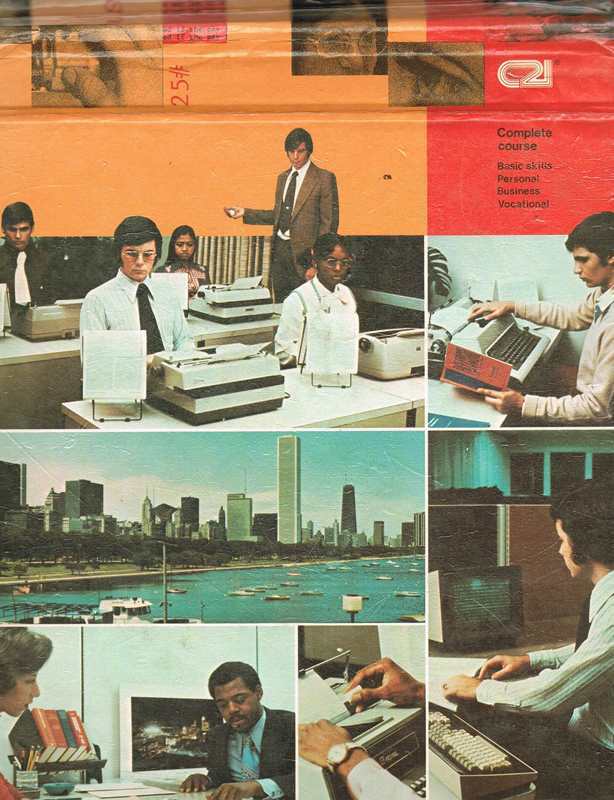 My library even has an electric typewriter for patron use, but this book predates even that piece of equipment by about two or even three decades. 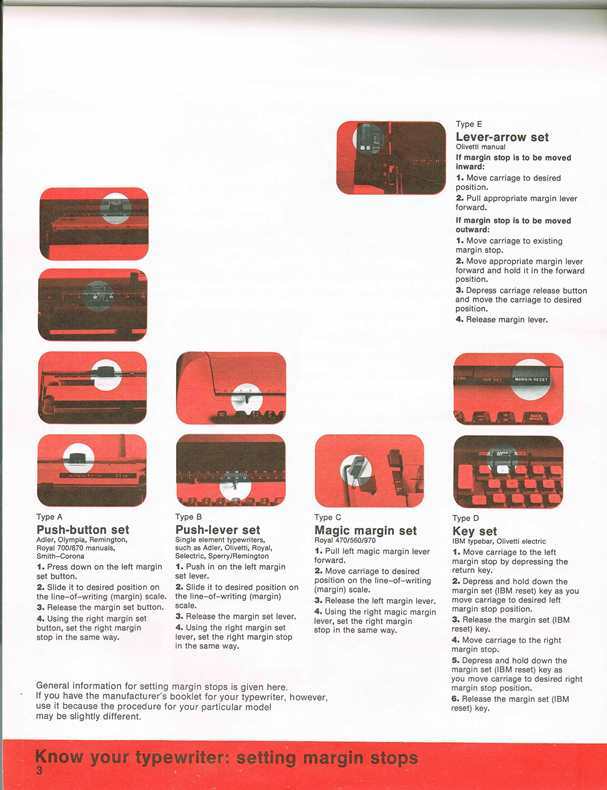 As you can see in the images below, this book is quite detailed on teaching you how a carriage return works and how to set margin stops. 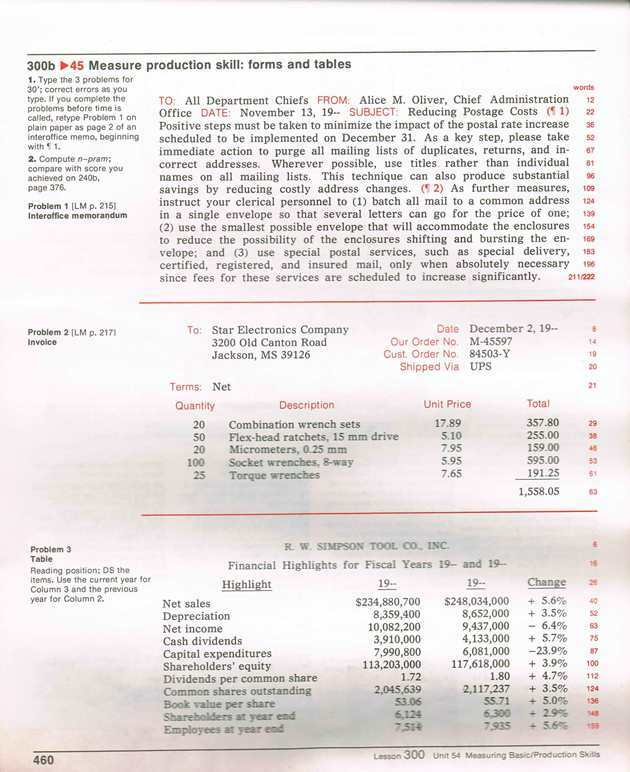 You can learn how to type a budget into beautiful columns, too. Just because you can doesn’t mean you should. (Excel, anyone?) Weed this and buy books on keyboarding, word processing, and spreadsheets. Enjoy a trip down memory lane with these pictures, though! Mary: I am sure this was one I used in high school. Ouch, I am so old. I woud actually love to own this book. I know…I’m a weirdo. I’ve been collecting vintage typewriters and it might be helpful 🙂 is there any way to see if the library that owns it is ready to weed it and add it to their book sale? I wouldn’t mind having this book myself. I love old typewriters, and I almost bought an old Selectric at Goodwill not too long ago (I didn’t have the money, though). Not only did I learn “keyboarding skills” (mine were never that great until computers came along with the magic “backspace” key), but also how to set up things like business letters and other common documents, plus — most importantly to me in high school and college — term papers, with real footnotes at the bottom of the page! This is the sort of thing your word-processor’s templates don’t teach — in fact they try to evade the idea of “teaching” with fill-in-the-blank stuff that’s not always relevant to what you really want to do. So yes, I would be tempted to keep at least one or two of these just for the office-skills aspect as well as the antique value (some people do still have manual typewriters). WRT trigonometry, Wikipedia still has a page on [[uses of trigonometry]] to justify it’s (trig’s) existence. I recently had a middle school girl tell me she was taking “keyboarding” & I asked her what songs she had learned to play. I had no idea that meant typing. I felt old! 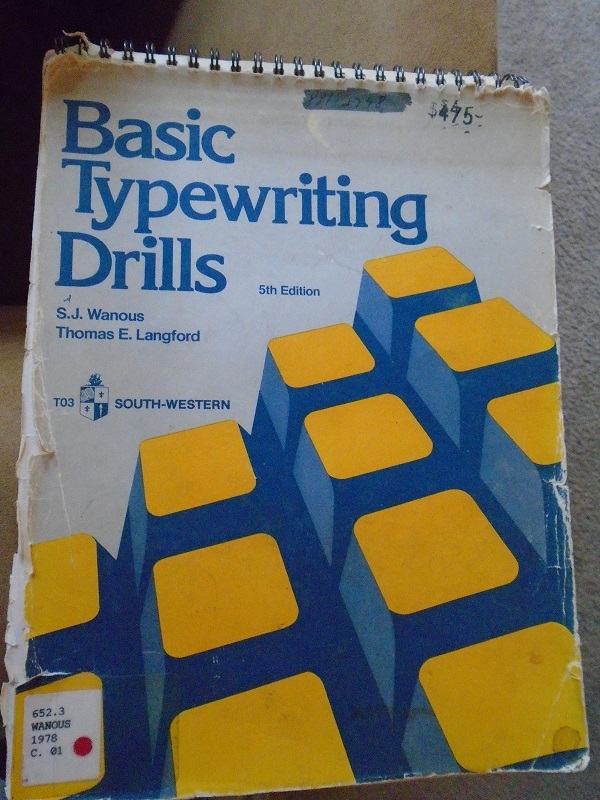 Much to my embarrassment, I just recently found a college typewriting course manual from 1981 in my business section. We, too, have typewriters available for patron use (and they do get used), but I’d much rather get a more current book on the subject than have something that is older than I am hanging out on the shelf. Don’t ask me why, but I typed my own dissertation on a French literature subject in 1971. I still have the typewriter with the special dead key to add French accents. I believe that the typewriter was made in Switzerland. Consumer Reports back then rated it as one of the best typewriters available. I should do some research to learn if it has any value as a collectible. Oh, puh-leeze! I think I used an edition previous to this one in high school. It certainly looks similar, if my ancient brain is to be believed. 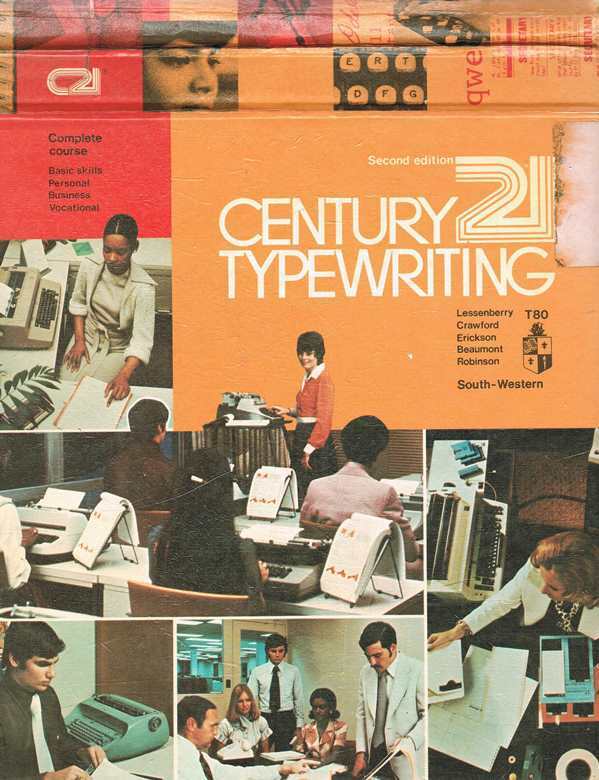 The typewriter on the bottom left-hand corner of the front cover looks like an IBM Selectric, which had a type ball instead of an assortment of type keys. They were certainly in use when this book was published. 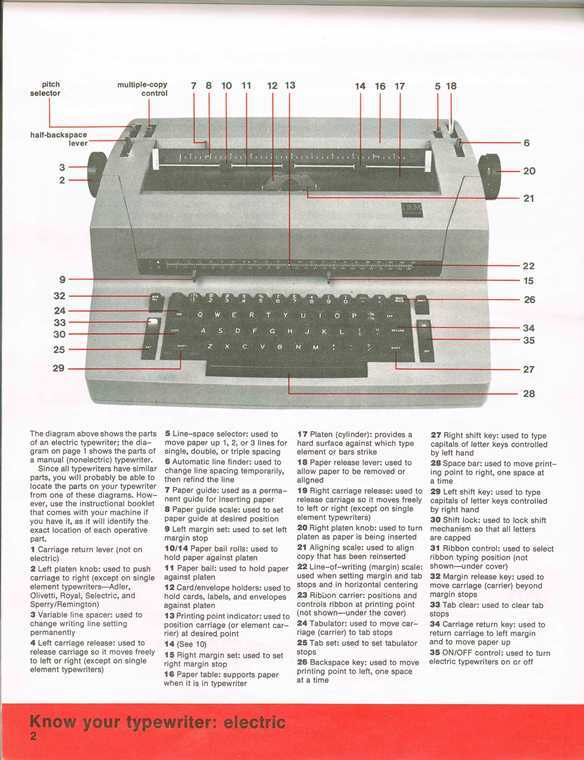 I’m guessing that the information about the manual carriage return was for people who couldn’t afford a Selectric. This book looks familiar. I may of used a different edition in high school in 1985 (maybe the 3rd). If you would like your very own copy, don’t wait for the library booksale: http://www.abebooks.com/book-search/isbn/0538208104/free-shipping/page-1/ I myself have just made the discovery that when typing on most computer fonts, one should only have one space after a period. 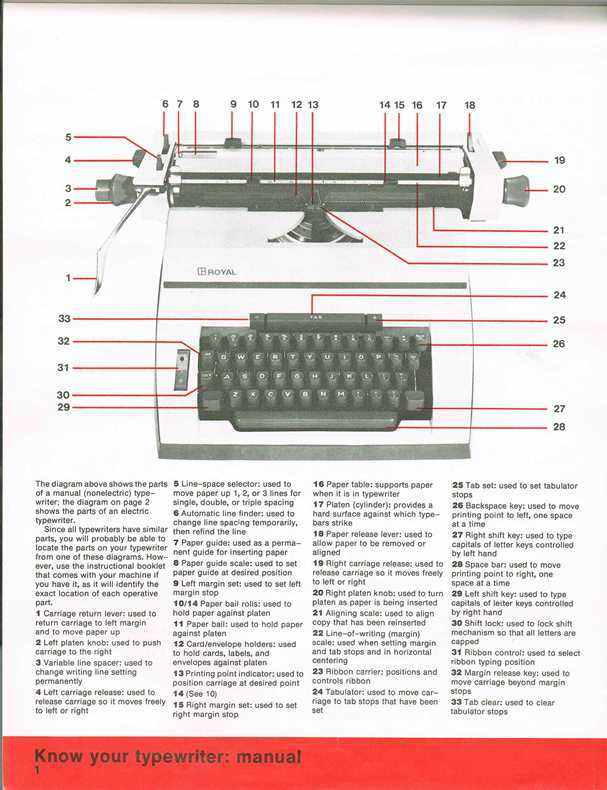 Before there was Microsoft Windoze, Word, and “Clippy” imposing their orthodoxy upon the business and personal world, there was the IBM Selectric–THE standard for school classes, businesses, etc. Seriously, WERE there any other electric typewriters in that era? In today’s world, if a kid showed up in high school not already being self-taught how to type on computer keyboards (to say nothing of cell phones), I assume Child Protective Services would be called promptly. I loved my Hermes portable. It took me through college and I still have it in the attic! That there is no 23 is the electric diagram; why’d they bother giving it a number if it’s not there? The (up-to-date) keyboarding books circulate very well at my small college library. You’d be surprised how many college students get a paper assigned and realize they need to learn how to type–NOW!! !